This week, Lucid Travel discussed our business development strategies. These included new markets to expand into, improving our customer success function, and building our social media strategy. For the past year, Lucid Travel had been focusing explicitly on university club sports travel. This approach has worked well. In the last eight months, we gained 80 new partners, putting us at 100 partners overall. The best time to partner with universities is before the start of their next semester. Otherwise, they are understandably too busy to acquire and implement a new system. To keep our growth consistent, we’ve decided to expand our market come mid-February. Our best idea was to contact tournament directors for soccer and baseball. This would set us up for summer revenue, and give us time to revisit universities during the summer before the Fall 2019 semester. On an exciting note, we were contacted by a dance group via Instagram. This lead to our discovery of dance competitions and contentions that organizes dance travel. We’re excited to reach out to see if there’s a possibility to partner with them. While our outbound sales strategy has been working well, we realize that it is hard to maintain at a high level. Outbound sales execution is only scalable linearly, not exponentially. In addition to finding new markets, Lucid considered influence marketing. If we could get a well-known person to endorse Lucid, we would make them an affiliate. They would earn commission through the bookings they inspire, thus making Lucid a stream of passive income for them. Lucid Travel has a lot of confirmed or trained university partners, but we need to do a better job at training our partners so that they’re set up for optimal success. We’re concerned that our one, 30 min demo is information overload for our partners. Lucid is really very simple and intuitive to use. All there is to do is click on their booking link (Here’s an example for Northeastern - northeastern.lucidhotels.us), and share it with the team. There’s no login required. We understand new things are hard to grasp at first and are considering making a high-quality, thirty second video explaining the process to send out in the future. Until then, we decided to call each of our partners to make sure they’re all good to go for the spring. We wanted to reinforce the message that Lucid Travel is easy to use, and to gain perspective on what’s working for our partners and what isn’t. To further incentivize this strategy, we could portray ourselves as an analytical team that uses our market survey results to show how much money they could be bringing in, and thus designing them to be a better, more profitable university. 1. Have you checked your booking link to assure its set up properly? If they say no, go through the four steps – search, list, hotel detail, book– with them quickly. Make sure to refer to the booking link as booking link. This will establish a common language between us and our customers. 2. Have you accessed your administrator account? 3. Have you added your booking link to your club sports website? This is what successful Lucid users have done to generate the most cash back. 4. Would you like to pool your cashback? We got a lot of good feedback from this team project. Our partners were really appreciative of us calling, and it demonstrated our customer success process is working as intended. In the future, Lucid wants to do more team projects in addition to our individual tasks. All good pitches start with an introductory piece of information to catch their attention. We want our pitch to be more of a conversation. We’ll ask them questions about how they book travel, what sort of problems they have, etc. After each answer, we’ll offer them a tidbit about Lucid that coincides with their answer. This will put the system into their understanding by taking through their own journey. They should be able to picture and understand the process without any information overload, by seeing how it would benefit them specifically. After all, everyone is the center of their own world. This week, Lucid Travel also seriously concentrated on our social media strategy. The hardest part of this operation has been deciding what kind of content to post. Whereas most pages that involve sports and travel post about games, or sports motivation, we want to stand out. We want to promote our best feature more – that we have the best rates in the market. But how? 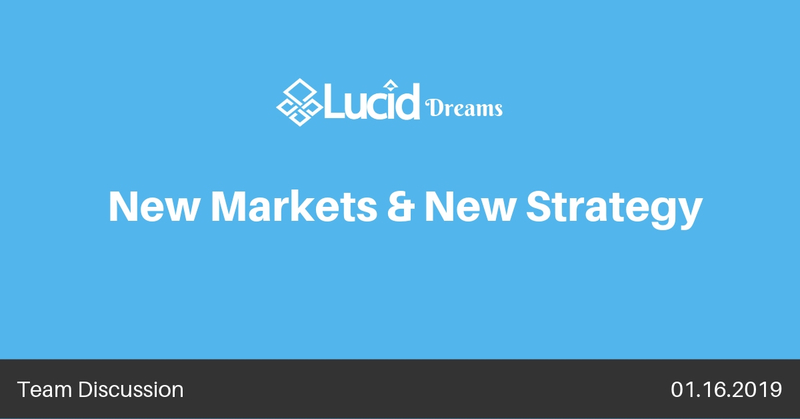 We’ll begin posting these Lucid’s Dreams articles on Linkedin to show the internal aspect of the company. We’ll post our Travel Tuesday articles, and announcements of exciting new partners. Additionally, we’ll begin posting about us more – who we are, and what working for Lucid looks like. Further content will include posts about client events. By compiling photos from events that our partnered teams attend, and tagging each team, we’ll establish connection amongst the teams with Lucid Travel as the medium. If this is successful in generating recognition and branding for Lucid, we could eventually have the teams send us their best photos to be featured. After all, the goal is to have more inbound traffic. In our previous post, Lucid Travel as a Media Company, Lucid talked about advertising discounted room blocks for big events. This week, we defined that idea to include in our social media content. We’ll look up events nationwide, and post about the best rate Lucid has in that city. This will be a great way to reach a broader audience. We were concerned that should someone come to our page, they might get the wrong idea that we’re merely for sports travel. If our pages are dominated by sporty content, they might think Lucid Travel doesn’t apply to them unless they’re involved in sports. This is not the case. Sports are our current niche market. Lucid Travel is designed for everyone. All of this content will be posted to our Instagram, Facebook, Twitter, and Linkedin, with appropriate variations and volume. Our team is working on the exact nature of the content and will be ready to launch by February.